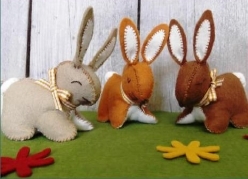 Contains everything you need to make 3 bunnies - felt, stuffing and even a needle. Comes in a brown card giftbox. Suitable for age 7 and up.